DATEDIF in Excel (Formula, Example) | How To Use DATEDIF Function? How to Use the DATEDIF Function in Excel? DATEDIF function is used to get the difference of days, week or years between two dates in Excel. DATEDIF excel function has three different arguments (Units) to find the difference of the dates in date, weeks and years. Here the unit stands for the months, years and days. “y” A difference in complete years. “m” A difference in a complete month. “d” A difference in complete days. “md” A difference in complete days, Ignoring months and years. “ym” A difference in complete months, Ignoring days and years. “yd” A difference in complete days, Ignoring years. As if we have two different dates, by Excel DATEDIF formula and it’s three arguments we can find the difference between those two dates in days, months and years as well. After applying DATEDIF formula you are supposed to get the result in number which represents the difference between the dates in excel. 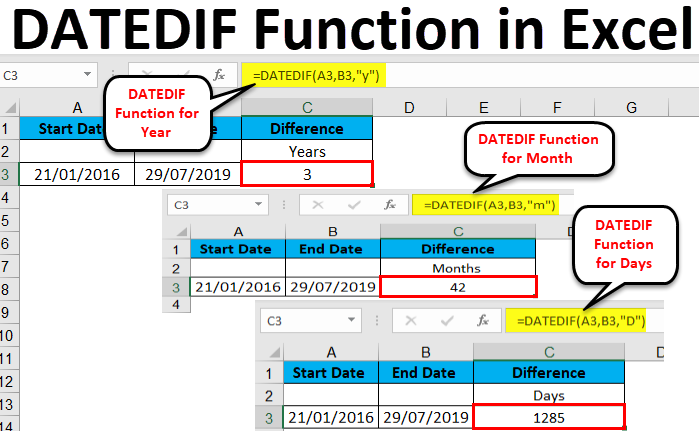 The DATEDIF function in excel is widely used for different purposes, here we take some of the examples. To calculate your age, we know that there are many tools for these calculations, but from Excel and this formula is the real fun. In many areas of corporate we can use it to identify the aging of the particular file/ report/ case, Honestly, I am using it very much in my MIS to know the aging of the claims, so I can decide my priorities and give the attention to the oldest. For an example let’s get the difference between two dates in years, for your better understanding, we will take the start date and end date similar in all examples. For an instance let’s assume Start Date as 21/01/2016 and End Date as 29/07/2019. Step 1 – Mention the start date and end date in the date format (Note: The format of the date can be changed from cell formatting), here we have formatted the date in dd/mm/yyyy format which is most common nowadays. Step 3 – Here for this example for start date select the rows accordingly and for a unit in the formula enter “y”(Note: Units always has to be mentioned in between double inverted comma), in this formula”y”stands for years. You can see that you got the answer 3 which means there is a difference of there years between the start date and end date. Now we have to find the difference in probably you can say that if there are 3 years then it should be around 36 months, true but as this formula doesn’t provide us the answer in fraction so we just need to find it by another formula which has “m”(Month) instead of years. As you can see from the images above that in this formula we have to use the unit “m” instead of “y”. Here for our example, you can see in the image that there are 42 months of gap between the start date and end date. By using the same formula with different units we can calculate the difference in days between these two dates. The difference in days is very useful, as you’re not able to get the fraction values using this formula, so when it comes to relatively smaller calculation, you need the most accurate data available. With this formula, you can calculate the difference in days and then you can divide it by 30, so you can get the difference in months most probably and then into years by dividing it with 12. We can see for our given example there is a difference of 1285 days. As per this units, the dates will behave like it’s been in the same month and the same year, Exactly like its showing the difference of date numerics. For given example it provides the difference between days is 8, as we have learned before that in this function with this unit only the dates will perform as numbers, so the difference between 29 and 21 we got is 8. So for the given example, it shows the answer 6, as the difference between month # 7 and month # 1 is 6. Now if the start date start date is of month #9 and end date is of month #1, as the answer this formula will show 4. As it will calculate that for the month that from month # 9 it will take 4 months to reach month # 1. So this is the logic used behind this formula or unit. From this particular function, you can find the difference in days between given dates, irrespective of years, it may count the months but only till the very next year and it always provides you the result in counting days. For the given example, it shows the answer 190. As per the given image you can see that by the unit “yd” it’s counting the difference from 21/07 to 29/01 for the given example. So far we have learned about six units for DATEDIF Function in excel. As a conclusion for all above examples, we can understand that to find the most accurate data, we should find the difference in days, for moderately accurate data find the difference in months and when the smaller difference of even months don’t bother our calculation try the difference in years. Here we have to keep in mind that when you are calculating the years or months, it might not be the exact answer, as the system has to consider an average day for every month and years. As we know all months do not have the same number of days. It might affect your calculation when you are calculating for very long spans so it should get the difference of about 1 month.